1Philippine Institute of Volcanology and Seismology. Correlation spectrometer measurements of sulfur dioxide (SO2) emission were an important contributor to successful prediction of the June 1991 eruption of Mount Pinatubo. Our first measurement in mid-May (500 tonnes per day) indicated that unrest involved intrusion of magma; a tenfold increase in SO2 output by late May implied that (1) magma was rising and (or) that (2) a hydrothermal system that absorbed volcanic gases was being boiled and thus removed, allowing more SO2 to reach the surface. A sudden, short-lived drop of SO2 output to 260 tonnes per day on June 5, even as seismicity was increasing, may have been caused by plugging or sealing of magma and fractures through which gas was escaping. On June 7, emissions rose again as a new dome was extruded, and our last preparoxysmal measurement on June 10 was more than 13,000 tonnes per day. Postparoxysmal emissions from July to August 1991, before formation of a caldera lake, ranged from 1,200 to 5,000 tonnes per day, as magma remaining in the conduit degassed. A second dome began to grow in July 1992. Measurements from July to November 1992 ranged from 200 to 600 tonnes per day with some isolated peaks of 1,000 tonnes per day. These measurements suggested that the magma was largely degassed or gas poor compared to that which was the source for preparoxysmal emissions (of 1991). During volcanic eruptions, the dominant magmatic gases are water, carbon dioxide, sulfur gases, and hydrogen chloride. The major sulfur species in volcanic gases are sulfur dioxide (SO2) and hydrogen sulfide (H2S). Although we did not know in advance that magma of Pinatubo is unusually sulfur rich, this fact and nearly a month of preeruption SO2 measurements aided greatly in successful prediction of the eruption. We measured SO2 emissions before and after the 1991 eruption of Mount Pinatubo by use of a correlation spectrometer (COSPEC IV, herein referred to as COSPEC, Barringer Instruments, Toronto). In the past two decades, COSPEC measurements have been part of routine monitoring at a number of volcanoes worldwide, including Kilauea (Casadevall and others, 1987), Mount St. Helens (Casadevall and others, 1983), and Redoubt (Casadevall and others, 1994) in the United States, Nevado del Ruiz (Williams and others, 1990) and Galeras in Colombia, and Merapi (Volcanological Survey of Indonesia, unpub. data, 1993) in Indonesia. The COSPEC uses solar ultraviolet light transmitted and scattered by the Earth's atmosphere as an illumination source. Pointed skyward during a traverse beneath a volcanic plume (fig. 1), the COSPEC compares the amount of ultraviolet light absorbed by SO2 in the plume to that absorbed by internal, SO2-filled calibration cells. Concentration-pathlength is expressed in units of parts per million-meters (ppm-m). A profile of SO2 concentration-pathlength across the plume is integrated over the width of the plume and multiplied by the plume speed (meters per second) to yield the emission rate of SO2 (metric tonnes per day, or t/d). Figure 1. To estimate SO2 flux, an aircraft carrying the COSPEC flies beneath and perpendicular to the plume to measure a cross-sectional profile of concentration-pathlength (ppm-m), which is integrated over the width of the plume and multiplied by the wind speed to get the rate of SO2 emission. Measured differences in SO2 emission rates may reflect actual differences in emission rate but can also reflect fluctuations in the wind speed and direction, change in conditions of cloud cover, change of sun angle and amount of solar ultraviolet radiation, and variations in plume opacity due to atmospheric cloud or suspended ash particles. Additional uncertainty in COSPEC measurements arises from several operational factors, including instrument calibration (+-2 percent) and chart reading error (+-4 percent), variation in aircraft speed during the measurement traverse (+-5 percent), operator variance affecting instrument operation and reduction of the data (+-5 percent), and measurement of wind speed and direction (+-10-40 percent, often a significant factor) (Casadevall and others, 1981; Stoiber and others, 1983). After a frustrating and unsuccessful attempt to borrow a light plane, surveys were begun at Mount Pinatubo on May 13, 1991, from a UH-1 helicopter provided by the U.S. Air Force at Clark Air Base. Beginning in early June, surveys were made from a T-41 Cessna provided by the Philippine Air Force. Readings made from the helicopter were noisy due to interference between a rotating disk within the COSPEC and the overhead rotor of the helicopter. The interference was minimized by aiming the COSPEC at a forward angle, shooting upward but avoiding the helicopter's main rotor blade. Data gathered from the fixed wing aircraft show a considerably better signal-to-noise ratio. Flying conditions were a frequent constraint, especially during the rainy season (June to November) and during a period of heavy ash fall for several months after the main eruption (June to September 1991). After the main eruption, the plane had to come from an air base more than 100 km from Mount Pinatubo, and, because fuel was unavailable at Clark Air Base, flying was limited to one to two passes before the plane had to return to its base. The largest uncertainty in our SO2 measurements is the wind-speed determination (the rate the plume is moving, in meters per second), which greatly affects the computation of SO2 output. Winds over Mount Pinatubo are quite variable, even over the short period that measurements are taken, and especially with altitude. We used forecasts of winds aloft and our own differencing of the aircraft's ground speed as we flew upwind and downwind (wind speed is the difference between upwind and downwind ground speed, divided by two). For winds of 10 knots or more, our uncertainty is probably less than 30 percent, but for light winds of 2 or 3 knots, our estimate of wind speed and thus of SO2 emission may be off by as much as 50 to 100 percent. On April 2, 1991, phreatic explosions north-northwest of the Pinatubo summit ejected steam and ash. People in the vicinity smelled hydrogen sulfide (H2S). On April 4, 1991, a Philippine Institute of Volcanology and Seismology (PHIVOLCS) team conducted an aerial survey and found a line of vigorously steaming vents across the north face of the volcano. The team judged that the unrest was of hydrothermal origin. 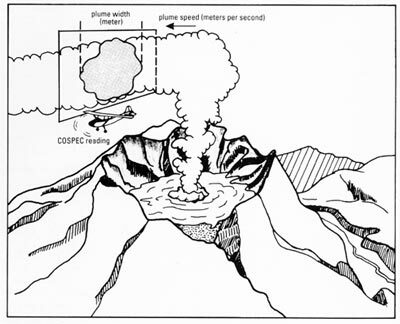 Vents at the northeastern side (where the phreatic explosions had occurred) were short lived; by the time COSPEC surveys were started, only five vents nearer to the summit were actively steaming. Seismic monitoring was started on April 5, and seismicity from that time until mid-May was characterized by high-frequency earthquakes (impulsive events) in a dense cluster between 3 to 5 km in depth, 5 km northwest of Pinatubo's summit. We considered the possibility that this clustering might be controlled by the presence of local structures in the northwest and that the unrest was of hydrothermal, magmatic, or tectonic origin. The initial COSPEC measurement was nearly 500 t/d (May 13), which told us that the activity involved magmatic intrusion 2 weeks before shallow earthquakes began to look magmatic. (Much later, after the eruption, deep earthquakes suggesting magma ascent from depth were discovered in seismic records of late May; White and others, this volume.) Without the COSPEC data, we might have concluded that the 3-5-km-deep earthquakes were of tectonic origin. By May 28, SO2 output had increased tenfold, to 5,000 t/d, and we inferred that magma was not only involved but rising. In retrospect, an alternative explanation of this increase in SO2 emission, compatible with magma rising, is that the hydrothermal system which would have been absorbing magmatic SO2 was being boiled away, allowing more and more SO2 from the magma to reach the surface. Seismicity during the last week of May 1991 increased and began to shift to shallower levels beneath the summit. Earthquakes took on an unmistakably volcanic character, and our earlier inference from COSPEC data, that magmawas involved and rising, was confirmed. In the first week of June 1991, increasingly frequent earthquakes defined a narrow cylindrical volume that extended from a depth of 5 km to the surface (Ambubuyog, 1992; Harlow and others, this volume). In sharp contrast, SO2 emission decreased, reaching a measured minimum of 260 t/d on June 5, 1991. Our interpretation was that a rising plug of viscous magma had either pinched shut cracks through which gas had been escaping or had cooled and (or) lost volatiles and developed an impermeable carapace, shutting off the escape of gas in either case (fig. 2). Figure 2. SO2 emission from May 13 to June 10, 1991, precursory to the paroxysmal eruption. Key developments in seismicity and dome growth are noted. On June 7, 1991, a lava dome began to grow at the site of one vigorous steam vent. Concurrent light to moderately heavy ash ejections drifted westward. SO2 output on June 7 and 8 was between 1,200 and 1,500 t/d. On June 10, the value jumped off scale (>13,000 t/d). Clearly, gases could once again escape. Owing to ash in the plume and associated hazards to aircraft, no further COSPEC measurements were made until after July 1991. The Total Ozone Mapping Spectrometer (TOMS), carried in the National Aeronautics and Space Administration's (NASA's) Nimbus-7 satellite, measured 110,000 t of SO2 in the June 12, 1991, eruption plume, and 20,000,000 t on June 15-16 (Bluth and others, 1992). Clearly, the amounts of SO2 released during the main explosive events were several orders of magnitude greater than emission before or after the main explosive events. Continuous ash emission from the new caldera and from secondary explosions, and pilots' new-found reluctance to fly near Mount Pinatubo, limited us to three COSPEC surveys between July 5 and August 7. SO2 fluxes were on the order of 1,200 to 3,200 t/d, still moderately high as magma continued to degas. Ash emission from the crater continued until September 4, 1991. After the last ash emission from the crater on September 4, 1991, rainy weather persisted and a lake was formed on the new caldera floor. The next COSPEC measurement was on October 3, 1991, when only 20 t/d was being emitted. The only visible fumaroles were on the southern caldera wall, and, when sampled in late September, these fumaroles had a maximum temperature of 180°C and were emitting mostly water vapor with minor amounts of volcanic gases (J. Durieux; oral commun., 1991). A different set of fumaroles sampled by the authors in February 1992 (maximum temperature of 105°C) showed the same: vaporized ground water with very little magmatic gas (W. Giggenbach, oral commun., 1992). Gas discharging from vents on the caldera floor during September 1991 to June 1992 was apparently dissolving in the new lake and thus increasing its acidity (Campita, Daag, and others, this volume). In July 1992, after a brief period of precursory seismicity, a new dome began to grow in the center of the caldera lake. Initially, small phreatic or phreatomagmatic explosions built a tuff cone; the dome then grew over, and completely covered, that tuff cone (Daag, Dolan, and others, this volume). SO2 gas emission during this period of dome growth (table 1) was variable but generally between 200 and 1,000 t/d, virtually all from fumaroles on the dome itself. Owing to logistical difficulties described earlier, our data are sparse, and uncertainties in wind speeds are high. Table 1. COSPEC measurements of SO2 at Mount Pinatubo, May 1991 to November 1992. Despite uncertainty about individual measurements, we think that SO2 output during the period of dome growth was generally lower than in 1991 and showed a roughly inverse relation to seismicity (fig. 3). In August 1992, SO2 output began to decline, and, at the same time, the number of shallow, "low-frequency" earthquakes increased. Many of these low frequency earthquakes resulted from shallow intrusion of magma (Ramos and others, this volume); some may have even occurred within the dome. 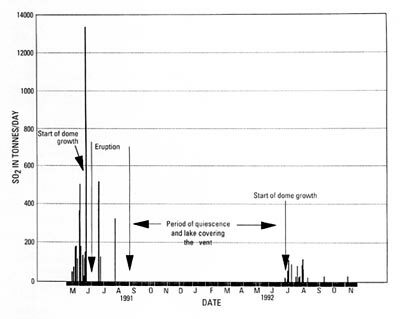 Although we were concerned at various times during July and August 1992 that renewed dome growth might be followed by renewed explosive eruptions, as in June 1991, the overall level of SO2 flux and, ultimately, the lack of explosive eruptions indicated a relatively degassed or gas-poor magma body (fig. 4). The inverse relation between seismicity and SO2 emission in 1992 may reflect relatively easy (and relatively aseismic) extrusion of slightly more volatile-rich lava during the early stage of dome growth, followed by more sluggish, more seismic, extrusion of volatile-poor lava after August. Figure 3. SO2 emission and seismicity, July�November 1992, a period of renewed dome growth. Note the generally inverse relation between seismicity and SO2 emission. SO2 emission in t/d. Figure 4. Comparison of SO2 flux in 1991 and 1992. Fluxes in 1992 were notably lower than those in 1991. COSPEC measurements of SO2 were invaluable in anticipating the 1991 eruptions of Mount Pinatubo, giving evidence of rising magma and (or) progressive boiling and thus depletion of hydrothermal water. The initial SO2 measurement of 500 t/d indicated that the unrest was of magmatic origin 2 to 3 weeks before shallow seismicity began to look volcanic. The tenfold increase from mid- to late-May 1991 told us, a week or more before earthquake hypocenters began to migrate upward, that magma was already rising and (or) boiling off the hydrothermal system. The enormous SO2 output of the paroxysmal eruption and retrospective evidence for high sulfur concentration in Pinatubo magma make it easy to understand the pronounced increase of SO2 emission in May 1991. However, similar levels of SO2 emission (5,000 t/d) have been observed at other volcanoes and were not followed by large explosive eruptions (for example, Nevado del Ruiz, Galeras, San Cristobal, and Etna). The daily flux of 5,000 t/d, by itself, did not tell us the magnitude of the impending eruption of Pinatubo. Rather, the geologic record of past eruptions suggested the most likely magnitude, and the pattern of increasing SO2 emission suggested that an eruption was imminent, especially after the sudden decrease and even greater increase in early June 1991. Postparoxysmal SO2 emissions are consistent with the idea that magma remaining at shallow depth beneath Mount Pinatubo is gas poor in comparison to that present before the June 15, 1991, eruption. Measurements during July and August 1991 hinted of declining emission, until development of the caldera lake effectively captured all of the emission. Even during renewed dome growth in 1992, when fumaroles were once again venting to the atmosphere, emission rates barely exceeded 1,000 t/d. Therefore, despite the possibility of further intrusions of basalt or hybrid andesite into the main body of dacitic magma (Pallister and others, this volume), we now suspect that further large explosive eruptions are unlikely. We thank Ken McGee of the Cascades Volcano Observatory for lending the COSPEC instrument, which was used in measuring the SO2 emissions at Pinatubo volcano, and Michael Doukas of the Alaska Volcano Observatory for providing a worksheet used to calculate SO2 fluxes. We also thank the U.S. 13th Air Force and the Philippine Air Force (Lipa Air Base and CABCOM) for aircraft support during the survey. Ambubuyog, G., 1992, Pre-eruption seismic interpretations of Mount Pinatubo: Unpublished report, PHIVOLCS, 36 p.
Bluth, G.J.S., Doiron, S.D., Krueger, A.J., Walter, L.S., and Schnetzler, C.C., 1992, Global tracking of the SO2 clouds from the June 1991 Mount Pinatubo eruptions, Geophysical Research Letters, v. 19,no. 2, p. 151-154. Casadevall, T.J., Stokes, J.B., Greenland, L.P., Malinconico, L.L., Casadevall, J.R., and Furukawa, B.T., 1987, SO2 and CO2 emission rates at Kilauea Volcano, 1979-1984, in Decker, R.W., Wright, T.L., and Stauffer, P.H., eds., Volcanism in Hawaii: U.S. Geological Survey Professional Paper 1350, v. 1, p. 771-780. Casadevall, T.J., Johnston, D.A., Harris, D.A., Rose, W.I., Jr., Malinconico, L.L., Jr., Stoiber, R.E., Bornhorst, T.J., Williams, S.N., Woodruff, L., and Thompson, J.M., 1981, SO2 emission rates at Mount St. Helens from March 29 through December, 1980, in Lipman, P.W., and Mullineaux, D.R., eds., The 1980 eruptions of Mount St. Helens: U.S. Geological Survey Professional Paper 1250, p. 193-200. Casadevall, T.J., Doukas, M.P., Neal, C.A., McGimsey, R.G. and Gardner, C.A., 1994, Emission rates of sulfur dioxide and carbon dioxide from Redoubt volcano, Alaska during the 1989-1990 eruptions, in Miller, T.P., and Chouet, B., eds., The 1989-1990 eruptions of Redoubt Volcano, Alaska: Journal of Volcanology and Geothermal Research, v. 62, p. 519-530. Casadevall, T.J., Rose, W.I., Jr., Gerlach, T., Greenland, L.P., Ewert, J., Wunderman, R., and Symonds, R., 1983, Gas emissions and the eruptions of Mount St. Helens through 1982: Science, v. 221, p. 1383-1385. Stoiber, R.E., Malinconico, L.L., Jr., and Williams, S.N., 1983, Use of the correlation spectrometer at volcanoes, in Tazieff, H., and Sabroux, J-C, eds., Forecasting volcanic eruptions: Amsterdam, Elsevier, p. 425-444. White, R.A., Precursory deep long-period earthquakes at Mount Pinatubo, Philippines: this volume, Spatio-temporal link to a basalt trigger. Williams, S.N., Sturchio, N.C., Calvache V., M.L., Mendez F., R., Londoño C., A., and Garcia P., N., 1990, Sulfur dioxide from Nevado del Ruiz volcano, Colombia: Total flux and isotopic constraints on its origin: Journal of Volcanology and Geothermal Research, v. 42, p. 53-68.